it will come with printer, CISS and lots of stuffs, you can try to make some hobbies. 6 months' warranty for the machines, not for the consumables. This multifunctional press includes T-shirt press, mug press, cap press and plate press, which can be easily changed for a particular job. It is an economical solution for all purpose commercial applications. 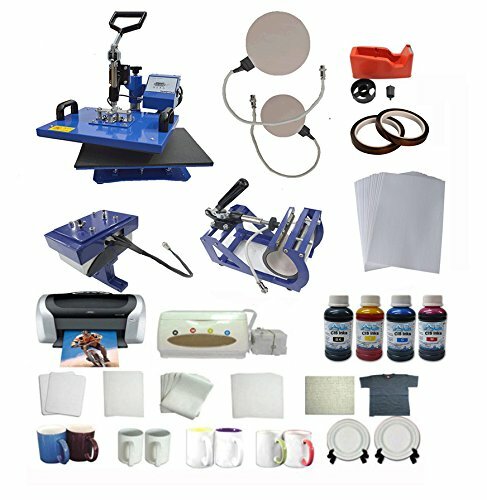 It can be able to apply transfers, letters, numbers and images on T-Shirts, garments, bags, mouse mats, jigsaw puzzles, ceramic tiles, cups, mugs, plates, baseball hats and any other items. If you have any questions about this product by Heat Transfer Packages, contact us by completing and submitting the form below. If you are looking for a specif part number, please include it with your message.